Here’s how the windows supposedly work. Glass panels are first treated with a photovoltaic coating made up of carbon, hydrogen, nitrogen, oxygen, and a few secret ingredients that SolarWindow is keeping under wraps. 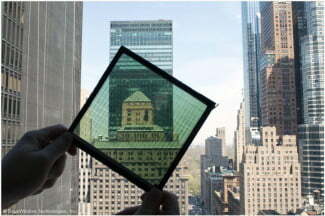 The “active layer” absorbs light, while the transparent conductors make energy extraction possible. For transparency, the coatings are applied in liquid form at ambient pressures and dried at low temps. The result is clear solar paneling, and the coatings can be added to any conventional glass or plastic. Logically, the SolarWindow coatings are designed to be applied to the interior of glass or plastic window units, to protect the coatings from the elements. They also plan on offering a 25-year warranty to match those offered by conventional solar panels. By comparison, traditional solar systems need 5-11 years to show an investment return, and that’s in addition to requiring 10-12 acres of space. SolarWindows claim that they can use natural, shaded, or even artificial light to produce energy, unlike conventional solar, which means they’re good for use on all four sides of a building instead of just on the roof. The SolarWindow’s Power Reinvented webcast showed a working version of the tech to participants and stakeholders last Thursday, August 20. Their website offers a slew of independent performance evaluations on everything from environmental impact to power comparisons ,so prospective buyers and media can draw their own conclusions. Ultimately, we’ll follow the evolution of the tech with our fingers crossed that SolarWindow can meet all of its claims. The paneling will reportedly be available within the next four years, so unfortunately you can’t order them today. However, if you’re doing a major home or commercial remodel or construct, it’s worth considering solar window tech over today's solar panels.